Native American waterways are less likely to be monitored for pollution. A crude oil pipeline slated to pass under the Missouri River and sacred Native American tribal land was one of the few hot-button political issues that neither Hillary Clinton nor Donald Trump wanted to touch during this election. 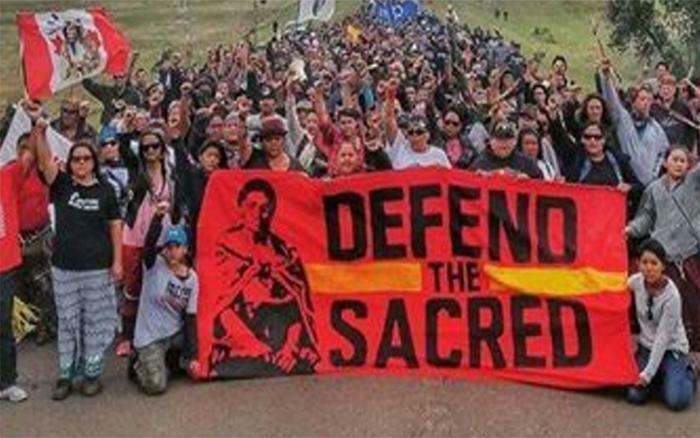 The Dakota Access Pipeline was approved by the feds last July and is expected to be completed by the end of the year, unless protesters successfully stop it. Protesters and lawsuits note that the Missouri River is an important source of drinking water for the Standing Rock Sioux Tribe, who have led the historic fight against the project. “Cognizant of multiple major spills from crude oil pipelines in recent years, the Tribe feared that an oil spill on the Missouri could pose an existential threat to the Tribe,” the Standing Rock Sioux wrote in a lawsuit last year alleging that the United States Army Corps of Engineers had fast-tracked the approval process for the pipeline. The Corps responded that the pipeline would pose “no significant impact” on the waterways. But if recent history is any indication, the federal government is probably not the best judge of protecting Native American waterways. A study published by Texas A&M researchers last month found that Native American tribal water utilities and water treatment plants are significantly less likely to face enforcement under the Clean Water Act and the Safe Drinking Water Act, even though such facilities are more likely to violate federal water laws. The report published in Policy Studies Journal found that tribal water facilities received 44 percent fewer inspections than water plants not on tribal land, even though tribal utilities committed 57 percent more drinking water violations. “This suggests regulatory neglect,” Manny Teodoro, a lead researcher on the study, told Environmental Health News. The story is not that different from that of other low-income, minority communities in America, which also often lack access to safe drinking water or any piped water at all. The Environmental Protection Agency has of course enforced some water violations on tribal land. In 2013, the agency reached a $136,000 settlement over drinking water violations on the Hopi Reservation. The Hopis’ public water supply system is controlled by the Department of Interior’s Bureau of Indian Affairs, and according to the EPA, the Bureau had failed to monitor drinking water for arsenic and disinfectant compounds, leading the water to grow contaminated. Most tribes are not in charge of enforcing Clean Water Act and Safe Drinking Water Act violations on their own water, as they must gain permission from the EPA to obtain that control. The EPA currently lists 53 tribes that it has deemed eligible to apply for that authority, a small fraction of the nation’s 567 federally-recognized tribes. The Navajo Nation was the first Native American tribe to achieve that feat when the EPA granted them regulatory control in 2001. The Navajo reportedly had to spend 10 years working on the application process before they finally won approval.